Coogan’s Design Build realizes that there’s a great benefit to a functional outdoor kitchen that matches the same quality as the inside and we’re here to help. A well planned outdoor kitchen can extend your entertainment space to the backyard and eliminate the need to constantly run back inside for more food, drinks or napkins. Whether it’s a just small cooking area to make outdoor grilling easier or a full size kitchen to a host large group. Coogan’s can quickly and efficiently construct your dream kitchen just in time to plan your next alfresco dinner party. Coogan’s Design Build has constructed hundreds of outdoor kitchens in Charlotte and perfectly planned cooking spaces based on individual need and budget. We can easily construct almost any open-air kitchen you can imagine including favorite components such as a gas grill, double sink, custom pizza oven, wet bar, ice machine, refrigerated beverage dispenser, sealed pantry cabinet, wine reserve, meat smoker, stainless warming drawer, outdoor refrigerator – you name it. Planning details and precise measurements of a space that is functional for cooking yet incorporate entertaining areas and traffic flow can feel overwhelming. 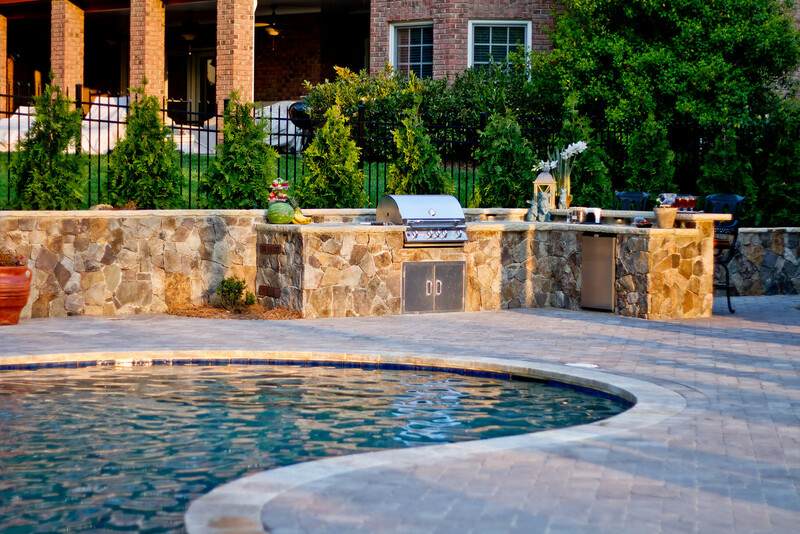 Our outdoor kitchen designers offer guidance with critical decisions such as appropriate size, angle and placement on your property in addition to mapping out specific entertaining, living, and outdoor kitchen cooking performance. A selection of high quality outdoor kitchen appliances can then be chosen as well as beautiful hardscape materials for patios and counters to complete your fabulous new al fresco kitchen. Contact us or call our local office in Charlotte at 704-889-1500 to schedule a consultation with a designer today. We make building outdoor kitchens easy! View a gallery of more custom Charlotte area Outdoor Kitchens.